Rosy Outlook: The Fall Dress You NEED + FF Link-Up! The Fall Dress You NEED + FF Link-Up! Happy Wednesday friends! Hope you're having a great week so far. I'm definitely ready for things to start calming down. I feel like it has been really hard to keep up with blogging lately which is why I have missed the last several Friday posts. I'm really hoping October I can start getting back to the 3 days a week schedule but for now I think 2 days is the maximum I can commit to. We're excited because this week my in-laws are visiting us in Boston! We can't wait to tour them around our favorite parts of the city. 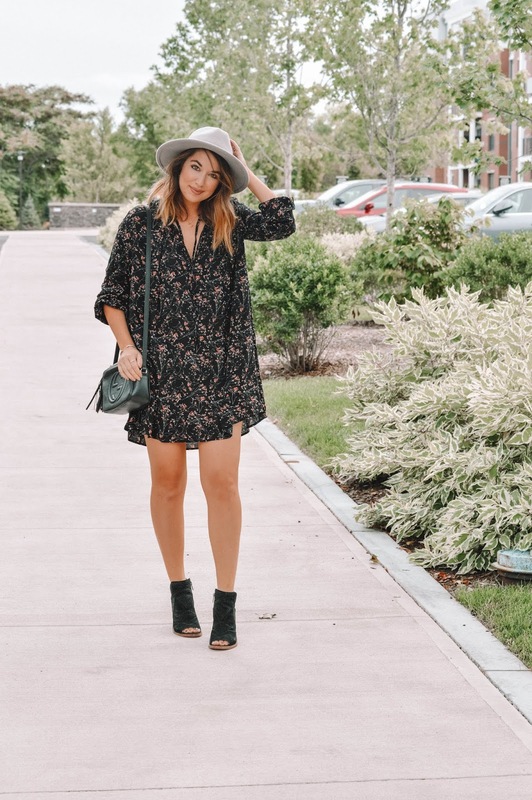 I LOVE a good dark floral print and the one on this dress is so pretty and perfect for fall. Unfortunately I think it is sold out right now (although if it does come back in stock I will share on IG stories) but I did post a few that are very similar. I love the boho style of it and that it has longer sleeves--perfect as it starts getting colder out. If you want to transition this dress even more into late fall/winter it would be SO cute paired with some OTK boots! I love A slight floral print on a black background. This is so so cute! I want this entire look, top to bottom! You are so right, everyone does need this dress, gorgeous! Thank you so much for the feature, I truly appreciate it! Aww..thanks for the feature, sweet friend!! Love this boho fall look! I want both the hat and dress ASAP in my closet!! Such a beautiful fall dress. That dress looks great on you and I love it with the boots and hat, really gives the outfit an edge. Thanks for the link-up. I love a cute dress that is also comfy and this one looks like it checks both boxes. Perfect with your peep-toe booties!!! I am so into dark florals for fall too! This dress is so cute - loving the long sleeves and it pairs perfectly with booties! Such a gorgeous outfit. So elegant and modern. I really like it. Dark florals are key for Fall/Winter! And I am totally a sucker for a good flowy, short, boho dress so I am digging that one you are wearing. Hopefully they restock it! This boho look is so adorable on you! Perfect for fall transition! Love the florals! Kelly this dress is absolutely adorable! I love the shape of the dress and the floral print. Such a cute boho look! That dress is way too cute girl, I'm loving it. Such a cute and sweet look you have here with your dress dear. You styled it beautifully with the hat too.